A special IDF report claims integration of religious soldiers in the service leads to discrimination against women -- in song. .A special report commissioned by the Advisor to the Chief of Staff on Women’s Affairs, Brig.-Gen Gila Kalifi-Amir, claims that the practical application of the “Proper Integration” concept, which addresses the integration of religious soldiers in the IDF, discriminates against women and affects their service negatively. The report was described in Wednesday’s Maariv newspaper. The report, not surprisingly as it was written for the Women's Affairs Advisor, recommends taking into consideration the needs of female soldiers as much the needs of the male religious servicemen, including combat and commando unit soldiers. The report suggests that soldiers who refuse to hear women sing out of Halakhic considerations (a halakhic prohibition that some are lenient with and others uphold strictly, see below, Ed.) should not serve as officers in the IDF, and should be relegated to the Haredi (Ultra-Orthodox) IDF Nachal brigade unit, a unit limited in its opportunities for combat service. The national religious religious sector produces many of the finest officers in the IDF, about 30% of the officer corps and an even higher percentage of combat units. 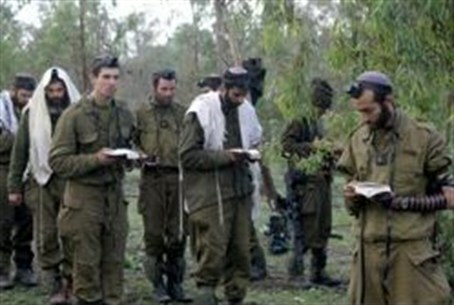 They are highly motivated, viewing service in the IDF as the fulfillment of a major Divine commandment. Yeshiva students approached randomly by Arutz Sheva on the issue remarked that it is in the army's best interest to accommodate their religious predilections. The IDF is primarily about quality combat service, defending Israel from implacable enemies, not singing performances. Additionally, maintaining a high standard of military gender separation keeps the soldiers more focused on their missions. Last October, religious cadets of the IDF officer course excused themselves from a memorial service for the late Yitzchak Rabin when a choir with women singers began to perform. They considered this part of their religious rights, and did not see the performance as a crucial part of their service, but since women's organizations considered this intolerable, the incident became a major issue. The report was submitted to the previous head of the IDF Manpower Division, Gen. Avi Zamir. Ma'ariv writes that he responded to it positively along with IDF Chief Rabbi Brig.-Gen. Rafi Peretz, but the report has not yet been implemented. The rabbi has since retracted his initial approval due to rabbinical pressure, and the COS Advisor on Women’s Affairs argued with his position before the Forum of the General Staff of the IDF. The previous Chief Rabbi of the IDF, Brig.-Gen.(Reserve) Rabbi Avi Rontzki responded to the report on Arutz Sheva radio. “There is a battle going on over the image of the IDF. This report, along with the recent demand to change the memorial service text from ‘May G-d remember’ to "May Israel remember" and the criticism of the soldiers' visits to the Kotel all stem from anti-religious groups trying to redefine the national image of the IDF." The rabbi states that the army must take into consideration the fact that religious men refuse to hear women sing .”So many soldiers, among them IDF brigade commanders and deputy-commanders, are religious. Anyone can be promoted in the IDF, and this is a democracy. The previous Golani Brigade Commander Moshe Tamir requested that the all-male IDF Rabbinate Choir perform at the brigade ceremony, to accommodate his many yeshiva-student soldiers." Rabbi Rontzki says that the issue between the Education Corps and the Rabbinate was resolved years ago, with mutual compromise, that led to successful cooperation. “I regret that the issues are surfacing again. Some groups know that the essence of the IDF and of the entire nation are at stake." According to Jewish Law, it is prohibited for males to hear a woman singing, as a guard against possible immodest behavior. Some latter-generation rabbis are of the opinion that this is only forbidden if the male is aware of the female singer’s appearance. Others are lenient when a group of females sing in unison, prohibiting only hearing a solo. Rabbi Avichai Rontzki, born October 10, 1951, is the former Chief Military Rabbi of the Israel Defense Forces. He served in the position from 2006 to 2010, with a rank of Brigadier General. His predecessor in that position was Rabbi Israel Weiss. Rabbi Rontzki is also the rosh yeshiva of the Hesder Yeshiva of Itamar, in Samaria.